I may have outdone myself tonight. At least with what little resources I have available here in the hotel. I made Ina’s herb-roasted salmon from her How Easy is That? cookbook. 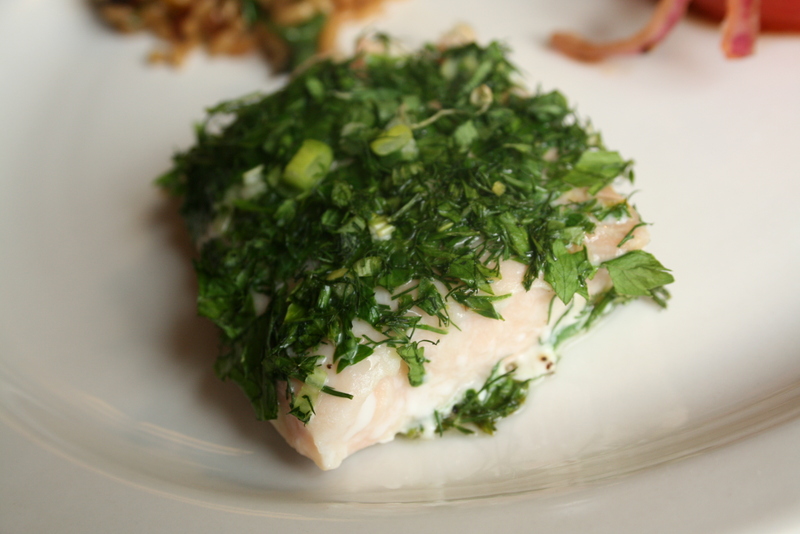 It’s basically salmon coated in chopped scallions, parsley and dill. YUM. It was incredibly fresh and light. A very thin drizzle of olive oil and lemon juice allowed the herbs to stick, and it was roasted with a little white wine. I LOVE things cooked with wine. I love being able to smell and taste just a hint of it. For once, I didn’t overcook the salmon. I’ll be honest; I like my salmon on the ‘done’ side. So does Andrew. I probably could have cooked it longer, but I didn’t want to turn it into rubber. There is a fine line between slightly done and WAY overdone. I threw together some balsamic vinegar and olive oil-marinated tomatoes and onions. 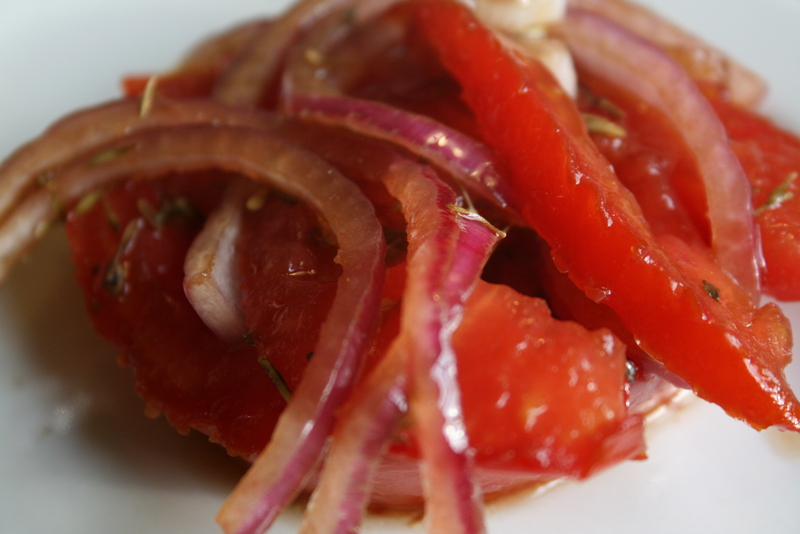 Growing up, my mom would thickly slice tomatoes and Vidalia onions and bathe them in a mixture of olive oil and balsamic vinegar. Ah, the memories. I don’t have any shallow dishes here, and all I had were red onions, so I went with what I had. Until this afternoon, I’d been using the balsamic drizzling syrup my mom got me in Italy for all my balsamic needs. While running errands on Main Street today, I popped into Tuscany On Main for a bottle of the good stuff. It was so neat to be able to actually sample the different vinegars–you can definitely tell a difference between the various kinds. Of the three regular balsamic vinegars (among COUNTLESS herb and fruit-infused vinegars and oils), I sprang for the ultra-premium “Cask 25” variety. (At only $12.99 I would hardly consider it that much of a splurge, but I felt fancy getting the top-of-the-line!) It’s been aged for 25 years in the barrel (obviously) and has distinct notes of wine, like port and madiera. The Cask 10 was lighter and fruiter and I didn’t prefer it. The Premium was more like what you’d find in the grocery store. Both the Cask 10 and 25’s were visibly thicker and syrupy. Needless to say, I had fun using it for dinner tonight! 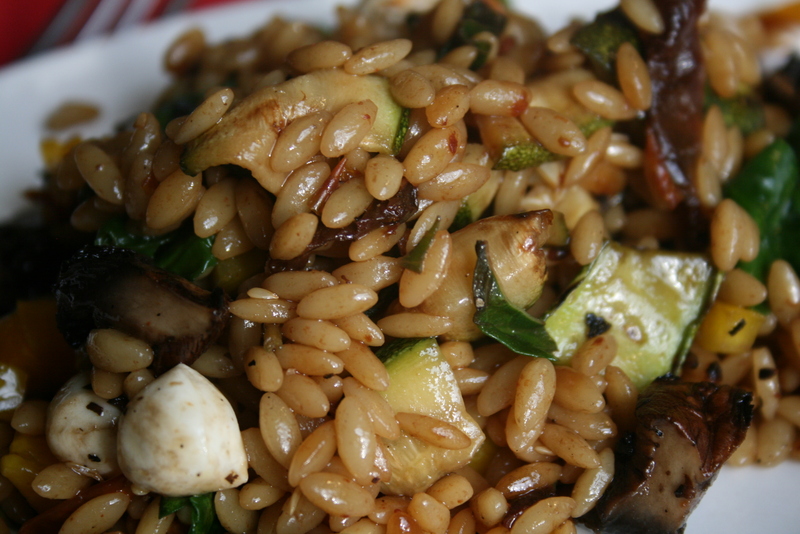 I had about 5 ounces of orzo hanging around, so I found a recipe in my Foster’s Market cookbook for a dish with grilled veggies, sun-dried tomatoes, mozzarella and greens. It was lightly dressed with olive oil, lemon juice and balsamic vinegar. Because I love my husband, I kept the grilled portobello mushrooms and mozzarella on the side and only added them to my half. Andrew really liked it! 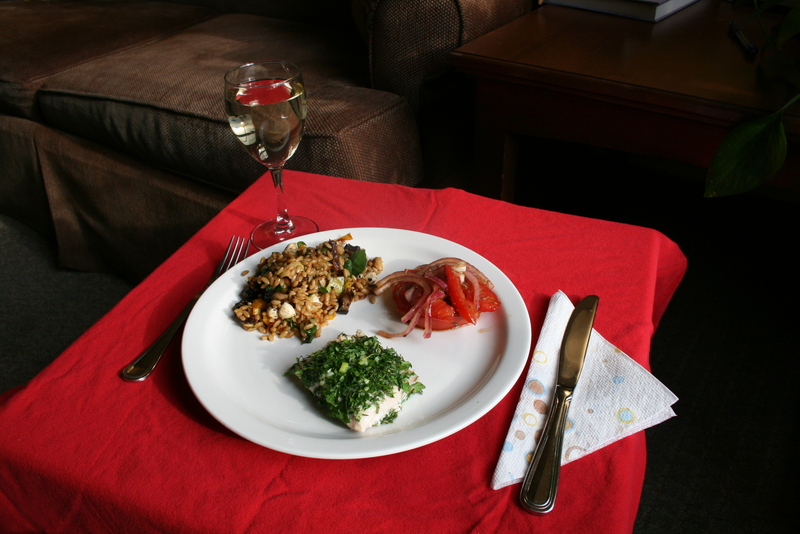 I served it all with a glass of Leonard Oakes’ Blanc d’Orleans wine, which I found in Reed’s Liquors this afternoon. I walked in and asked for a recommendation of a New York wine. It’s a little drier than Andrew and I are used to, but I liked it very much. The bottle says it’s “gooseberry, honeysuckle, grapefruit and melon. Slate and straw and subtle spice. Crisp, complex and completely refreshing.” I wanted something that would go with our salmon tonight, our chicken tomorrow and our quinoa Thursday, and I think I chose well. I also got a glowing recommendation for a local Riesling that I’ll be picking up next time we need one. We had just enough leftover (dinner, not the wine) for me to have lunch tomorrow–yay! Tomorrow morning I’m blending a banana into my beet smoothie to sweeten it up and make it more “breakfast-y.” It’s my pilates/yoga and kickboxing day, which means a big breakfast! Posted on August 2, 2011 February 27, 2016 by thehealthypineapplePosted in MainsTagged balsamic dressing, barefoot contessa, orzo, salmon, tomatoes. Next Next post: size 4’s!